The staff at Sixsmith Towers lined up on the gravel drive to welcome the Young Master (Young Master!!!) home on Saturday night. From the humblest chambermaid, whose job it is to pick up his discarded copies of When Saturday Comes, Soccer Star and Big and Bouncy (he gets it for the gardening tips) to Gove, his Gentleman’s Gentleman, there were feelings of pleasure that the Young Master had had his first “good “day since he returned from his shooting holiday in Norfolk in August and relief that they no longer had to both literally and metaphorically walk on egg shells. The former is due to his disconcerting habit of going for Cook’s egg store and throwing her finest organic free rangers at the wall while muttering something about the inability of a goalkeeper to save a shot or a defence to mark at corners, while the latter would see a tortured soul roaming the house weeping and crying out for the return of those ghosts from the past, Messrs McNab, Mulhall and Crossan. The Young Master assembled us in the library and recounted his day to us. He told us of the luxury of the Lee’s Silver Service coach that took him and his fellow footballing aristocrats down the A1 and the A38 directly to Burton-upon-Trent. He bemoaned the fact that trips were less enjoyable since the sad death of Brian Matthew and the end of Sounds of the Sixties. The programme is now on earlier and is hosted by some half-witted baboon called Tony Burnley or Accrington or Oswaldtwistle (I am reliably informed by Hamilton the chauffeur, that it is Tony Blackburn – a prize arse in 1967 and more so now I am led to believe). He described arriving in a town that was dedicated to the art of brewing due to the quality of the water in the area and we waited with bated breath to see whether he had abandoned his weeks of abstinence and had ventured inside one of the many public houses that adorned the town. 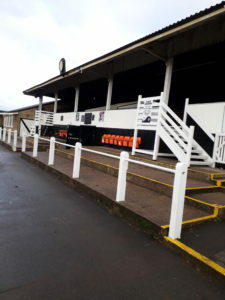 We were hopeful when he told us that he had visited Burton Rugby Club, who play on the old Burton Swifts/United ground at Peel Croft and who have an old wooden grandstand which dates back to 1907, to the days when the Very Old Master was still exercising the droit de seigneur over the virgins of Eldon Lane. Best of luck there…..
After a wander through the disappointing shopping centre (no Fortnum and Mason, no Harvey Nichols and no Gentleman’s Outfitters to rival Northern Clothing of Shildon), he got on his knees and begged our forgiveness as he described his visit to a public house. It was called The Dog and boasted that it was Burton’s CAMRA Pub of the Year for 2017. The female staff wept silently as he told them of the temptations that were laid before him. 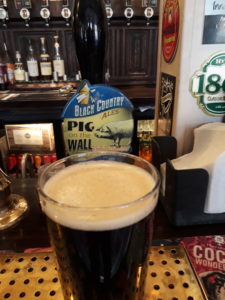 Draught Bass, Black Country Breweries full range and even a Milk Stout, so redolent of the Old Master’s favourite TV programme Coronation Street. He told us how he bought a half of the Milk Stout and sat alone in a corner sipping his half and thinking about all those profound conversations between Ena Sharples, Minnie Caldwell and Martha Longhurst in the snug of the Rover’s Return – how Bobby the cat was off his food, how Florrie Lindley’s cream curls were too often off and how that Elsie Tanner was no better than she was supposed to be. This warm nostalgia of bygone days when footballers never wore gloves, when music made sense and when a television remote control was Grayson, the soon to be dismissed third footman, disappeared when some of the chaps from the coach arrived in the pub. These were salt of the earth types, men who had got their hands dirty in the offices of National Savings or 3Ms and who knew a thing or two about life. There was a muted gasp as he described his first pint of Draught Bass in the tones that the late Lord Clark would have described a Vermeer painting and then a sigh of disappointment as he told of sipping a pint of Black Country’s Pig on the Wall, a splendid dark mild that made us all want to hire our own charabanc for a trip to Burton (“Maybe next season” said the ever generous and kind Young Master). He told of getting on a bus with the common folk of Burton who recognised a gentleman in their midst and doffed their caps and tugged their forelocks (I think he said that – the hearing is a bit dicky) as he deigned to ride their Arriva chariot to the Pirelli Stadium. We took a break here as tea and pilchard sandwiches were handed round and the Young Master gazed benevolently on his staff. There was Herd, the old Scottish gardener, silently munching his pilchards. At the back of the room stood Montgomery, the keeper of the Young Master’s Bedroom with his resplendent shock of white hair, chatting to Hurley the veteran gamekeeper. All was well in the world. Alighting from the bus to shouts of “Good on yer sir” from the other occupants, he told us how he was searched at the turnstile by a man with a strange accent which he assumed was the method of speech used by the locals. He entered the stadium and looked for the box that he had been promised only to find that there had been an error and he had been allocated a space on the standing terrace. Now we come to the tragic bit. The Young Master, face red with shame, succumbed to a Pukka Pie. Brydon, his dietician, swooned and had to be carried out of the room as he described the meat and potato savoury that he ate as he stood chatting to various rough types who had also entered the stadium. Rough but with those wonderfully kind hearts that only the British worker possesses and which, combined with their native wit, makes the British worker the finest in the world – as long as it doesn’t involve fruit picking, warehouse work or missing the Jeremy Kyle Show. After another break for tea and cake (The Young Master chewed on a Coop Belgian Bun while slurping his Earl Grey) we arrived at the reason for his visit to this town of 72,000 people, a population smaller than that of either Darlington or Hartlepool and whose football team play in the second tier of English football, alongside one time giants of the game such as Derby County, Aston Villa, Wolverhampton Wanderers and, er, Sunderland. The Young Master quite likes the cut of the new manager’s jib. He seems enthusiastic and knows what is required of him. He had a couple of players back after injury and suspension, so out went Gibson (who had played well at Villa) and Gooch (just a bit lightweight) and in came Cattermole and McNair, to give us some physicality in the centre of the park. For 45 minutes, nay an hour, the Young Master described a game that was going nowhere. He recounted that at half time one of his fellow spectators, a retired schoolmaster from Bedford, opined that the first goal would win this game and we all roared with laughter at the YM’s witty riposte “Well, I jolly well hope that it’s ours.” We sat on the edge of our metaphorical seats as he told us of the substitutions that the fiery Welshman, Coleman The Manager made, replacing a flagging McNair (the YM thought that he was well short of match fitness) with Gibson, the disappointing McGeady with the enthusiastic Vaughan and McManaman with the promising and ultimately match winning Asoro. As a poor game entered its final 10 minutes, we oohed and aahed as he described the penalty we might have had and the chance that we blazed over the bar. But then came the coup de grace as they say in France. A corner, well taken by Oviedo was flicked on by Cattermole and bundled into the net by Vaughan. He ran to the celebrating crowd in the seats down the side, kicked the corner flag (yellow card for James) and the mood of gloom that had been over Wearside and its environs since September, began to lift. The YM recounted the jig that he danced on the terraces while hugging a lady from Essex whose husband was at home looking after the grandson. She bagged the single ticket that their season card points allowed them. They’ll be wanting the vote next. A few minutes later, young Asoro swept past the fatigued Burton defenders and his cross shot may well have been going in but Honeyman made sure and the game was over. 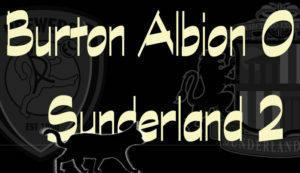 The Burton fans headed for their Marmite and Branston Pickle sandwiches as the Sunderland fans celebrated wildly at the prospect of an unlikely treble – a win, a clean sheet and no yellow card for Lee Cattermole. The Young Master’s view was that, while Burton were not very good, it was a win and wins breed confidence. 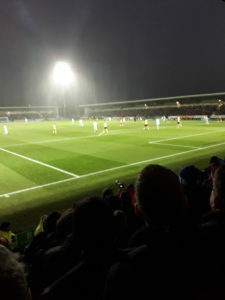 However, it is not much good to win this one and then fail to beat Reading, a side almost as poor as Burton and ourselves. But in Coleman the Manager, we seem to have someone who prepares well and who can get his substitutions right – something that his two immediate predecessors were not great at. Was this a slick performance from Sunderland at the Pirelli? The Young Master sat down to cheering and the throwing of hats into the air. Many of the younger staff were visibly moved by this account of a win and carried on the celebrations in the Butler’s under pantry late into the night. For the Young Master it was a welcome result as he now disappears for a month to partake in winter sports in Stanhope and Jesmond. The latter could be interesting after the local team were quashed by Watford. The Young Master expressed inordinate pleasure at this and said that he looks forward to a moanfest on Total Sport on Monday night. So James Vaughan finally shows that he can score goals, admittedly against the quality of opponents he may have been more familiar with when he played at Bury, but how unprofessional to get himself suspended with his “celebration”. It may have been a release of frustration but as a professional he should know what he did would attract a yellow card, that he already had 4 and would now not be available for the Reading game. Hardly professional. Hardly a shining example of the team ethic. I hope he doesn’t get paid whilst he’s under suspension and I hope Coleman and Symons make him aware of his responsibilities. His actions were on a par with Kieran Richardson’s shirt removal, Jason McAteer’s sending off in the F.A. Cup semi final against Millwall and Andrea Dossena’s irresponsible tackle at Hull City. Not sure that the “Young Master” has ever danced a jig! I’m not going to bother getting the Sunday papers, nothing could beat that article! First time I ever heard the term “devilled kidneys” was on Adam Adamant! I was always impressed that Adam Adamant threw darts by holding the flights and flicking them at the board. Funny what you remember. I may be considered biased, but this is a masterpiece. David Miller had never heard the devilled kidney/Adam Adamant yet happily accepts the words Virgin and Eldon Lane in close proximity. Best thing I’ve read in ages. 3 points helps, of course. I followed the game on Twitter sat in Calais Passports control on my coach full of Xmas shoppers if Caribbean descent. Experience suggests we all now think we are back on the winning trail again (not sure when the last one was) only to be grounded again at speed. Strangely confident about Colman though. January will be crucial. What a beautiful piece of writing. Team organisation and effective substitutions suggest some cautious optimism is in order. Perhaps also there is the much-needed reconnection between team and supporters. Pity I shall miss the ‘Young Master’ at Wolverhampton. What a spiffing read! I laughed so much my monocle fell out several times and I spilled Pimm’s on my cravat! The work of a true literary genius. Great read to round off a rather pleasant weekend. Please let there be more of them. A wonderfully amusing and entertaining read. Devilled kidneys, kedgeree and,as I remember colleagues and bus drivers from the area saying “aye up, me duck” all in the same article. 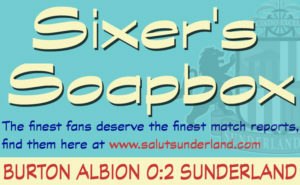 The only sites I read regularly about SAFC are The Guardian and Salut! Sunderland, for such original articles told by a mackem.